You can also refer a 9 day travel itinerary for Leh – Zanskar – Leh. 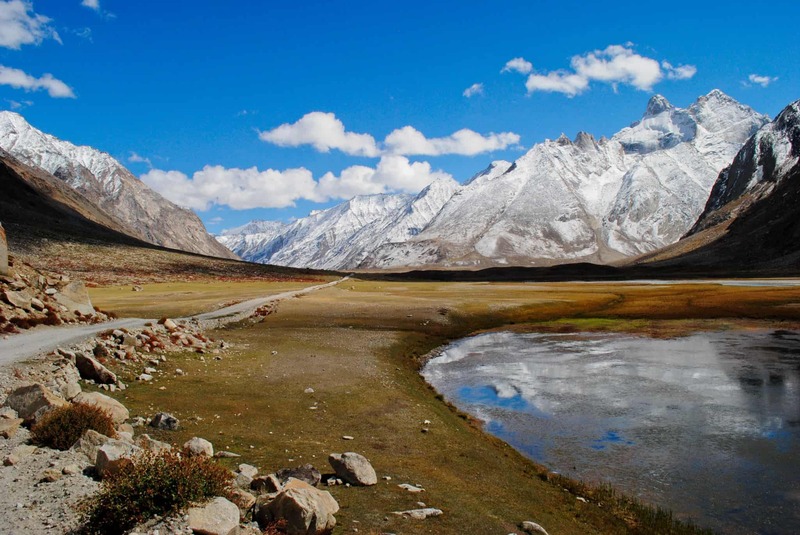 I hope this common of itinerary for Zanskar Valley will be useful for travelers planning their journey at least for the first time to this hidden wonderland. I will look forward for any queries or doubts or valuable suggestions and inputs you have and would love to discuss about your custom plan as well in comments section. First of all, thank you for all the information on Zanskar. I keep coming back here every time i plan to go to the trans- Himalayan region. I like the Leh-Zanskar- Leh plan , i need to know if i can make the entire trip in a single taxi and how much will be the approx. cost ? Basically, need more input on the taxi part as it looks quite complicated. Also, i am planning for last week of september , will it be ok for zanskar? No Himadri, the entire trip is not possible in a single taxi as only Kargil taxis can go for a drop to Padum and then only Padum based taxis can do local sightseeing in Zanskar. So, you will need a Leh taxi to drop you at Kargil, then Kargil taxi to reach Padum and finally Padum taxi that can do sightseeing in Zanskar and drop you to Leh. Last week of September should be good. I am planning for Zanskar Valley trip this July’18. I just want to ask is this a good time to visit Zanskar Valley. Also we are planning for bike trip from Srinagar. Are bikes on rent avaialbe in Srinagar. Please suggest me the itinerary. We are planning to visit Zanskar in the 1st week of June. I wish if u can help me on several things. We are planning to cover Zanskar, Leh, and one lake out of Pangong and Moriri. Going via Srinagar and back via Manali on my XuV500. What r stay options in Kargil, Padum, Rangdum and Tso Moriri? Do we need to make advanced reservations? Do we need any permit to visit any of these places? — Monastery tour may include Hemis, Thicksey, Stakna and Shey monasteries. They come on the route of Pangong Tso but as you will be doing day trip, it will be a bit hectic to include them on that day only. Thank u very much. This will be really helpful in planning. What about stay options?? Aaman Guest House (just 3-4 kms after entering Kargil check post), it was a homestay and stay and food was awesome. Daspa Guest House (confused it with other) near bypass bridge. Name: Mr. Gulam Mohammed; Mob: 09469730240. Go with Omasila Hotel/Guest House and at Rangdum, La Himalaya Homestay/Guest House. No Rio, there is no road from Lamayuru to Zanskar made through yet. It will take couple of years and that road is from Nimmu, near Leh going through Chilling to Zanskar. Hopefully this year end, the road from Darcha, Manali – Leh Highway to Padum, Zanskar will be made through. Kargil to Padum road opens up by mid June in general. Yes Penzi La will be open, so you can make the trip to Zanskar during that time. Has Darcha – Padum road opened for traffic? No, the road from Darcha – Padum is not yet open. Have planned to visit Zanskar valley in 2018. My travel route plan is as mentioned below. Reach Srinagar by flight – Drass – Kargil – Padum / Zanskar Sight seeing – back to Kargil – visit Batalik [Dah & Hanu Village] – visit Mulbech Buddha – Leh hotel drop – Take flight from Leh. 1. Will it be possible for a single cab driver to make us travel through the entire route? If answer is NO, please tell us as per respective taxi union norms, how many cab driver needs to be arranged and what will be there operating route. 2. Is there any separate list of cab drivers for Kargil-Zanskar area in your blog? If YES, please give us the link. 3. Is there any direct road to reach Mulbech from Daah village or do I need to go back to Kargil again for starting my journey towards Mulbech? You will need a driver from Kargil who will be able to take care of the entire trip. Nowadays even in Zanskar, outside taxis run but that might change or not change in next season. So, I will suggest that you hire Kargil based driver taxi and go for the entire trip up to drop to Leh. You can call the local drivers directly to connect with them and check the more comprehensive List of Taxi Drivers for Ladakh – Srinagar – Leh – Manali with recommendations/reviews for DoW community members. You should take Batalik route to Dah Hanu and can come down Chitkan village form Dah and go back towards Mulbekh. If that route is closed, I will suggest to skip Mulbekh and head to Lamayuru only as it is not worth to track back for the buddha statue that can be covered later on. Also, there is a similar statue at KhartcheKhar village near Sankoo. So, you can visit that instead. Thanks a ton for your reply. Below is a first cut plan for our Zanskar Tour. 6th Aug Mon – Travel up to Padum. Stay at Padum. 9th Aug Thurs – Travel up to Kargil, all en route sight seeing including Rangdum etc. 10th Aug Fri – Go to Batalik for visiting Aryans village, then go to Mulbech Buddha. Same day travel up to Leh. Stay at Leh. 12th Aug Sun – Return from Leh by flight. 1. If the plan is weather wise OK or not. Possibilities of tour getting spoiled for rainfall etc. 2. We want to hire a car with local driver. Which car will be better – innova / xylo / scorpio? We are a group of 2-3 persons. 3. We are Indian citizen. Please let me know, how many permits we need to collect for this tour and from where the same could be collected. [During our Ladakh tour all permits were arranged by our hotel manager]. 4. As of now, if there is any certain regulation about the road or not. [Example: Rohtang Pass stay closed for cars on every Tuesday]. 1. The plan looks fine but I will again suggest skipping Mulbekh as it will add unnecessarily travel but still I think there is rest day in Leh, so manageable but your choice on it. 2. Go for Xylo or Innova in that preference only. 3. No permit is required to visit Zanskar Valley but as you will be going through Batalik route, you may need permit from Kargil DC office just for that day. 4. The time you are visiting, there will be no road issues. All the passes including Zojila Pass and Penzila Pass will be open all the time unless of course there is no landslide. 7 Sep : Delhi – Leh and go to Lamayuru for night stay (about 115 km – but rather acclimatize at Lamayuru) or stay at Leh and acclimatize? Depending on the situation in Kashmir, which seems normal at tourist spots as of now as per updates from most DoW Community forum members, I will prefer to go from Srinagar and come back from Leh. Thanks Dheeraj. Will share an account of the trip on the forums. We have planned Delhi to Leh trip from 16th June to 1st Jul(16 day) , with 2nd july as buffer. My first question, is it worth to visit padum village keeping 2 days in plan. and next day continue to Leh journey..
We are confused because we won’t be able to explore places around Zanskar in 2 days.. Please suggest, we want to see as mush places as we can. It is not at all worth visiting Padum in just two days. Have at least 4 days at hand. distance within 850KM. Please suggest. I hope this itinerary could be useful for travelers, thanks to my friend Mikesh. I will suggest to take it easy and do not stress upon to include Zanskar Valley. Max if you have two days is what you can do is, make a trip to Rangdum – Penzi La pass, stay overnight at Rangdum and return to Kargil next. You will be able to cover Suru Valley at least. Trying to stress upon to fit Zanskar Valley will do only harm then good to the overall nice plan. Go directly to Turtuk without stopping in Hunder, then next day come back and stay at Hunder, Deskit enjoy these village and next day go to PAngong Tso via Shyok route in company of other vehicles. I just want to share my trip experience with everyone and to thank you for guidance. You were right, we should not have destined to padum. Journey was too hectic, weather was extremely bad due to rain and cold and guess what, we missed to have lunch at Rangdhum because someone told us there are villages across penzi La. So we end up eating chocolates that we carried. Actually there was issue with self start in one bike so we planned to stay at padum instead of rangdhum so that we can get mechanic in morning. Otherwise trip was superb, we followed LEH -> Pangong (Man) -> Merak -> Chushul -> Loma -> Hanle -> Sumdo -> Morriri -> Tso Kar -> Tandi route. This was nearly 850 KM circuit so we carried total 67 liter petrol for 2 bullet. At end we had 7-8 ltrs extra fuel. I saw petrol pump under construction near to observatory route, which could be bliss for traveler if completes. Also observatory timings are 10AM – 5PM, we reached after 5 so missed to visit observatory, fellow travelers could note it. During end on manali highway we witness hardship near jispa because of cloudburst, we stayed at tent shop in zing zing bar and it was very difficult to cross baralacha having rain, cold and clouds around. 1. Prefer trip on your own vehicles, we spent nearly 10K extra on rent bike as it was in very bad condition and unexpected breakdown, like self issue make us ‘dhaka-start’ experts. 2. Himalayan bike have few major problems, like coil get burnt, tight clutch, gear lever too tight and rear break shoe. Still if you are riding it, remember if self isn’t working, it means coil is gone. Lot of Himalayan were facing issue. 3. Please carry bike tool kit, plas etc and if your bike have luggage carrier take extra screws, because constant jerks will rip off the carrier screws. 4. Don’t forget to carry extra fuel, maybe you use it, but on the way struck bikers can get help. I met biker coming back from spiti due to bad weather and was out of petrol, so we happily helped him. They are experts, especially Mohan sharma and service fee etc are very genuine. Once again, thank you so much Dheeraj. How much money would be required for accomodation and food considering the 8 day plan approx?? It depends on how are you traveling. What is the commute? Food and stay I generally take about 1000-1200 per day on an average. Yeah, if you are OK to search few place on reaching there and are not that much choosy about stay then well yes, you can do so on the spot too. What is the taxi rate from Kargil to Padum and back to Kargil if I reserve a private taxi ? 1 day rest at Padum local sightseeing . I know this cost is different as I have to take separate car. Kargil to Padum and back will cost around 28-30K for private taxi. Local taxi in Padum will cost around 4K. When the road Kargil to Padum is expected to open this year considering Manali Leh opening earlier this year inspite of heavy snowfall ? It is expected to open by the first week of June. Right now as per a bit stale updates road clearance has not reached Randgum from Kargil side and yet to reach Penzi La from Zanskar side. Thanks for replying on Zanskar query. I understand October is not a good time for Manali to Leh. However if I travel to and fro Leh by flight from Delhi Mid October do you see any issue to have a trip to Tso Moriri, Nubra , Pangong Tso in October middle keeping in mind that snowfall may happen anytime in Leh particularly those areas like Chang La, Khardung La etc. Another query.. I heard nowadays we have accommodation in between Kargil and Padum in places like Parakchik, Panikhar, rangdum. So e can break journey at Parakchik instead of rangdum or we can reach padum in 3 days from Kargil with night stays at Parakchik, Rangdum as we have 7 year old kid. What kind of accommodation we have at Parakchik and RANGDUM ? aPART FROM THESE TWO PLACES ANY OTHER ACCOMMODATION IN BETWEEN ? Well, as you may know that age does not matter for acclimatization and 7-year-old kid can easily communicate annoyance/health issues. So, let’s not keep age factor in play here. Now, doing KArgil – Padum in 3 days, well, I understand you plan to break it in between but frankly speaking Rangdum is much harsh place than Padum and it does not help staying up there while going to Padum. Also, these places do not have medical facilities while Padum has a big hospital where things can be taken care if something goes wrong. Parakchik stay is very basic. If I were you, I will always stick to doing Kargil to Padum directly, resting in Padum for a couple of days, then while coming back overnight stay at Rangdum where La Himalaya Guest House is not up and running with attached bathrooms. Thanks for the response. I am planning Zanskar this july. Another question…I read in one of your threads on Zanskar that couple of new roads being built – Darcha to Padum and Leh to Padum. What’s the status on thee roads ? Are these complete or when they are expected to be operational ? Can tourists like me go from Darcha to Shingo la at the moment ? Do BRO allow Darcha to Shingo La? do we need separate permission for that ? If I plan to come back from Leh to Manali I wish to visit Shingo la with an extra day at hand. is that possible ? What about the rest of the strectch from Shingo La to Padum ? What about Leh to Padum ? Both roads are work in progress and not yet operational. Darcha to Shingo La pass is open but not any further and no permission is required. You can do it while staying at Jispa. Padum to Shingo La is not open yet. Nilavra, how many days do you have in hand. I am just curious to know as you have many threads open, for Zanskar, PAngi, Lahaul, Ladakh with all destinations ;)…. Anyways, back to question, both Tso Moriri and PAngong tso get very chilly and windy in nights and morning by that time. Consider sub-zero. So, not an ideal time to enjoy the nature. The snowfall can happen but that may block the road for only a day or two as it is not persistent snowfall unless you have luck running out from you. Many thanks for your patience to answer all my queries. I am going for Zanskar trip in July and am having another plan for Leh trip in Mid october. So two trips in this year. Any idea when Shingo La to Padum will open ? How many years ? In couple of years at least. 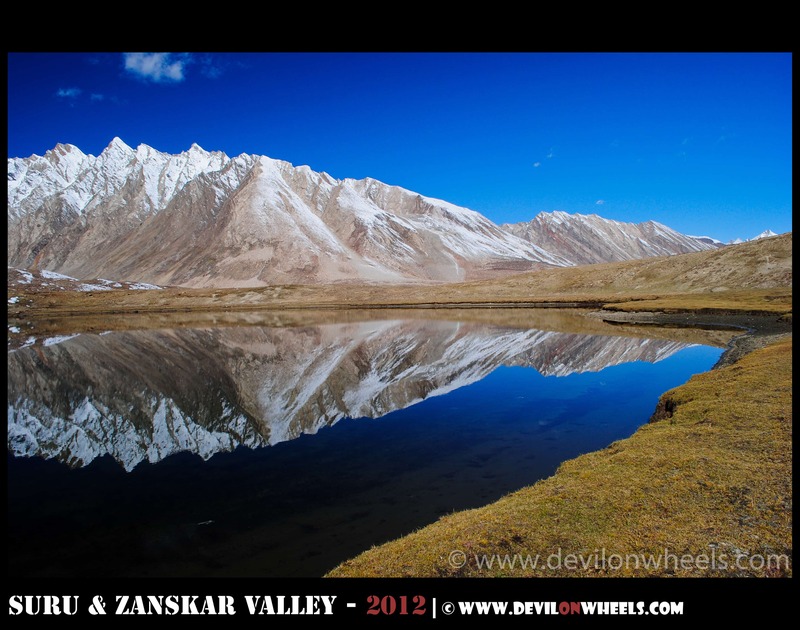 Is it possible to have Zanskar trip mid october ? I mean Kargil to Padum ? As you say Manali Leh is not advised in October so what about the zanskar trip in mid october ? Do people go to Padum that time of the year ? Now a days, people do travel but keep in mind it gets cold and dry in Zanskar as well. Also, snowfall may happen but since last few years, snowfall is delayed mostly. HI, This is Pankit, My Cousin is Planning MANALI – LEH in JULY 17…. I wanted some information …. Harish, better postpone the trip by couple of weeks as the Manali – Leh will not be open during that time of the year. Harish, Zanskar Valley will most likely be closed during that time as Penzi La will open around the first week of June. Then Srinagar – Leh Highway will be open and most likely Manali-Leh will open too. You have 12 days in hand and can easily refer a very balanced and most common itinerary for Leh – Ladakh followed by many travellers including me at the link here for 13-14 days: Most Common Itinerary for Leh – Ladakh. Drop the rest day to make it 12 day plan. I want to visit Zanskar Valley with the Leh-Ladakh tour. Is it possible to visit Zanskar directly from Leh through Zanskar Valley Road (not via Kargil) by Car in the end of September? Can you tell me any alternate tour plan including Zanskar with Leh trip? I have only 10 days in hand for the trip. The direct road between Zanskar Valley and Ladakh has not been built/completed yet, so the only way to travel to Zanskar Valley is via Kargil only. Zanskar Valley needs at least 4 days ex. Kargil. Two days are required to reach Kargil from Leh and come back to Leh or Srinagar. This makes it 6 days. In case you are flying, you can do these 6 days and after returning to Leh, you can make a trip to Nubra Valley for 2 days and Pangong Tso for two days. Finally on Day 11 fly back from Leh. Thanks a lot Dheeraj for your valuable reply and also for the plan. Now we can make a proper plan. We have a plan to return through Manali, therefore this time may be we could not cover Zanskar. Is it working? and what about Turtuk? Can you give few more details? 3. Take direct route from Nubra Valley to Pangong Tso. Thanks again Dheeraj for the reply. We have traveled Kinnau-Spitiwith Chandrataal in the last year. So we need much rest for acclimatization. As you suggest we can move Pangong Tso from Nubra, so we can manage one day extra which we can add on second day. I have some more queries, accommodations for Pangong Tso, Tso Moriri and Jispa. What do u suggest for stay among Sarchu, Jispa and Keylong? And what about Turtuk? How it is? I have seen few images and information through internet. Turtuk needs an extra day in Nubra Valley in case you want to make a trip. If you have one extra day it will be worth the visit. 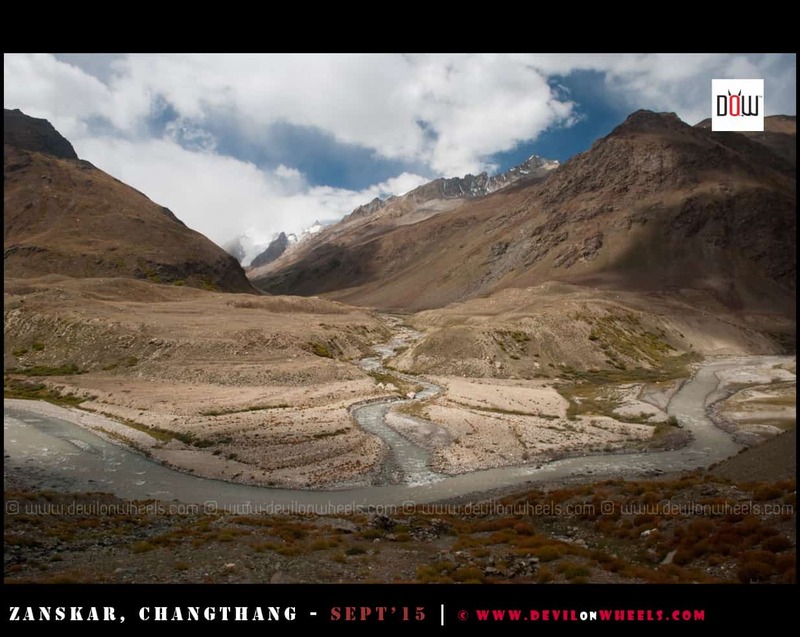 We have traveled Kinnau-Spiti with Chandrataal in the last year. We have faced few problems. So we need much rest for acclimatization in Leh. Just replied to other comment, make sure that you rest for two days in that case for sure. how it looks with new direct road to Zanskar valley? When is the planned finish deadline? Is it possible to pedalling with bicycle (not motor bike) trough it now? The direct route to Zanskar Valley from Leh as well as Darcha – Manali is not yet complete. There was a setback on Padum side due to a flash flood last to last year. If you plan to pedal it, it will be quite a lot of journey where you will need to carry it while trekking. The road from Darcha to Shingo La and few KMs beyond has been opened by BRO last year but beyond that to reach Padum you may have to carry the bicycle alot. If you can get the porters and mules, it could be worth a try. If I have to go by Srinagar -Zanskar- Leh route , do you mean I will need 3 different taxi for the entire trip. I have been to kashmir and ladakh separately , now Zanskar is on my cards. Do you have any recommended taxi driver for srinagar to zanskar and zanskar site seeing and drop to leh? That is a great piece of information , thanks a lot Dheeraj. What is the best way to travel from Srinagar to Kargil on budget or do I will need to hire a taxi for dropping? Can it be done in public transport ? How much time will it take? I finished my trip to Zankar valley. (Shared taxi). including trek to Phutkal monastery. And Padum was really awesome, such a big valley. My return journey from Padum to Kargil was night journey, and it was different experience though. (Because of some time constraints, I had). Awseome Rohith !! How about sharing the travel tale with us in DoW Community. It will be helpful to many other fellow travelers. Is it possible to visit zanskar valley in mid nov, with a fwd high gc car. It will be veru risky affair and not recommended at all because Penzi La close at anytime. Last time I asked about Spiti, which I have put on hold and instead want to plan Zanskar in July. The quotes I have received for the taxi are exorbitant. Rs 36,000 fro a four day trip from Kargil to Padum and back to kargil. the overall itinerary is as follows. Since I shall be travelling with wife and kinds, the program is relaxed. Well the camps too are expensive at Rangdum. Any suggestions? Are the Taxi fares Okay? we are planning for trip from srinagar to leh . But people are saying that road condition from srinagar to leh is not good for bike and also there will be lot of dust. so what should we prefer bike or public transport ? we will prefer bike if road are smooth . our Ladakh trip is coming closer and one question is in my head: How about electricity in certain places? – Just need to charge my camera battery (cannot use solar power bank with Canon chargers…). In which of the following is this possible? Thank you so much for your information and for sharing your experience. This would help me a lot to plan our 50-days-Ladakh-trip. 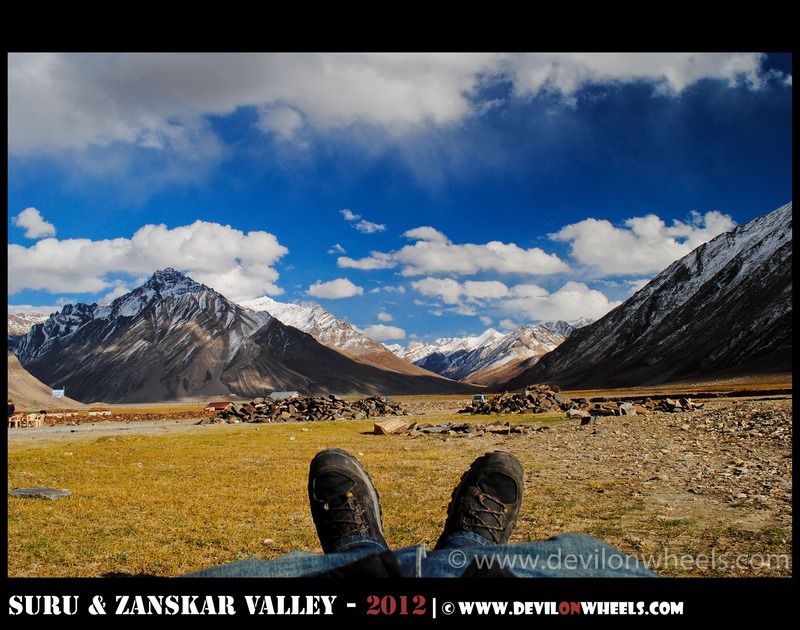 I was wondering is it possible to add Zanskar Valley to the 14 days most common Srinagar-Kargil-Leh-Manali trip? Because the Zanskar Valley itself take 8 days as stated above. I’m from Indonesia and i’m not sure if i can go back to Ladakh again in the future so i hope i can cover all the places if it’s possible (with time effeciency, and money issues of course haha). Or maybe can you suggest me another itinerary to cover best places at Jammu-Khasmir and Ladakh in less than 18 days? Zanskar Valley needs about 3-4 days at minimum from Kargil. So, within 14 days, well, it will be too much to ask for. You will need to skip one of the places in Ladakh in order to accomodate it. You can at most save two days, one by directly flying to Srinagar and other by removing the rest day in that common itinerary for Ladakh. You will still needs at least 1-2 days to add Zanskar Valley. Fly to Srinagar, saves you one day. Reach Kargil the next day, then move to Padum from Kargil. Rest day at Padum and local sightseeing next day, next day start for Rangdum enjoying the journey in between with longer stopovers, finally reach Kargil or Mulbekh or Lamayuru next day. From there resume the 14 day plan. Remove rest day from the plan and well you should be good to go with 18 days. Wow it seems like a really though trip. I think i’ll just skip Zanskar for this time. That will be better bet. It’s good to know that we can reach Padum with Public transportation. I have already planned to reach Srinagar in July/2016. > But, Do I have anything else than Hanle? I have visited other places in my previous visits. > I would miss Kargil-Leh route, Lamayouru and Hanle. Hmm, well there are many routes like Pangong Tso – Nubra connects with 3 routes, I am not sure which one you took. Then Pangong Tso – Tso Moriri connects via 3 routes, not sure which one you took. Kargil to Leh is connected by two routes too not sure which one you too. You can try all these places as well 🙂 … Refer DoW Maps of Ladakh to explore any routes that you might not have taken. Zanskar Valley should be done as a dedicated trip, so focus on it only this time. I think, I will plan for Zanskar only. As I am travelling solo, just worried about the journey. Anyways, I will update on my travel once I finish. Anyways, I have 4 more months to plan. Sure, feel free to post any queries you have for your Zanskar Valley plans. As usual amazing info regarding any destination in the Himalyas. Just wanted to confirm one thing. Can the above 8/9 day itinerary be done using public transport? Or is it difficult to get public transport in Zanskar? Jatin, with public transport as well it can be done. Buses do run between all these places but within Padum/Zanskar you might have to rely on shared taxis or private taxi only.